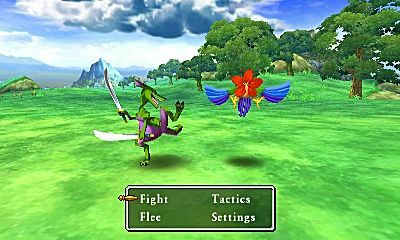 Battles are an integral part to almost every JRPG out there. 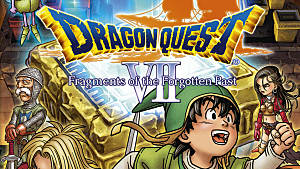 The same is true for Dragon Quest VII: Fragments of the Forgotten Past. While the UI can only be described as minimalist, Dragon Quest can still be difficult for those who are new to the series, returning to this remake from the NES to PlayStation days, and everyone in between. 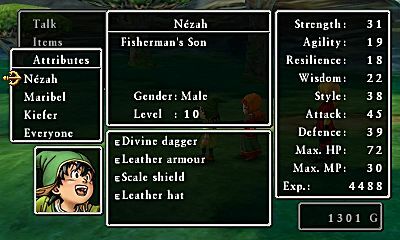 Understanding character stats in any JRPG can be intimidating the first time. Thankfully, Dragon Quest isn't known for being overly complicated. By pressing the X button and navigating to "Attributes" you can see all of your character's statistics laid out for you. The screen in the top left tells you which character you are looking at, their class, gender, and level. Below that is your character's current equipment. 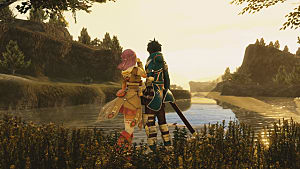 Depending on the character, they will be able to equip a weapon, armor set, shield, headgear, and accessory. Equipped items count toward your inventory limit on each character, so you'll decide carefully whether a low level piece of armor is worth an item slot. Strength: The character's physical strength. This is added to weapon bonuses to determine how much damage an enemy will take. Can be increased by consuming a Seed of Strength. Agility: Agility decides which character will attack first - in relation to enemy attacks. 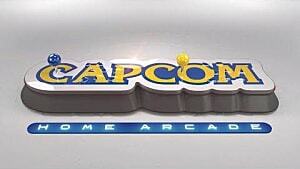 This will also determine how often a character dodges enemy physical attacks. By consuming a Seed of Agility this stat will rise accordingly. Resilience: This stat determines how hard of a hit your character can take. This is added to the character's armor total to determine how much damage they will take from monsters. Seeds of Resilience will increase this attribute. Wisdom: Both magic evasion and damage is determined by this attribute. The higher Wisdom is, the more damage you will deal with magic, and the higher chance you will evade. Seeds of Wisdom increase this attribute. Style: By far the least known attribute, Style determines a character's charisma. This is only important for placement contests such as the World Style Ranking. In other words, it has little use in battle. It is determined by the gear you wear. Attack: Not to be confused with Strength, Attack is the main total used to determine how much damage you do. All traits, strength, and accessory bonuses form this score. This is checked against enemy's Defense stat to determine the damage dealt when using the "Attack" command. Defense: The total derived from your armor and resilience scores. This is used to check how much damage you will take from enemy attacks based on the enemy's Attack stat. 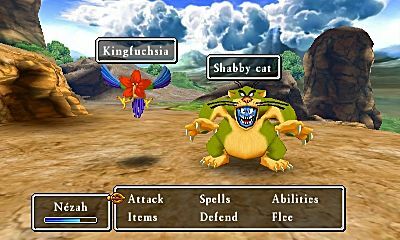 Battles in Dragon Quest are deceivingly simple thanks to the minimalist user interface. When battles first begin, you will be faced with four options: Fight, Tactics, Flee, and Settings. The "Settings" option can be ignored for the most part as that simply takes you to the options menu. Attack: This command will cause the selected character to use a melee attack on the selected monster. Spells: This will open a sub-menu that gives you several options: Offensive, Defensive, and Other. "Offensive" spells deal damage, "defensive" spells heal or remove ailments, and "other" spells give buffs. They typically cost MP and/or have damage or effects determined by your wisdom attribute. Abilities: Similar to spells, abilities will open a new sub-menu with the same options and functions as spells. The difference is that abilities typically do not cost MP, and are determined by strength instead of wisdom. 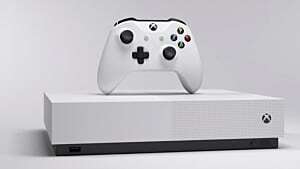 Items: This opens up the inventory of the selected character. It is important to note that the items available will reflect only those in that particular character's inventory. Defend: As the name suggests, the character assumes a defensive pose. They will take less damage, but they will not deal any damage either. Flee: This commands the character to flee. If successful, the entire party will flee. Once a decision has been made, you will need to select which target to attack. 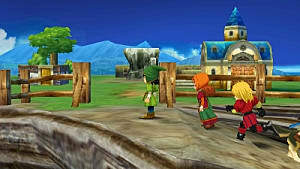 In Dragon Quest VII, similar enemies will form groups. As such, you can only select your target if they are a different monster. 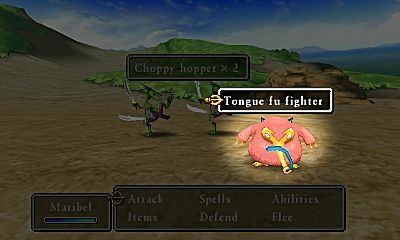 In the example below, you can rather choose to attack the Tongue fu fighter, or the two Choppy hoppers. When battle commences, the characters will attack groups of monsters based on which will die first. If neither enemy is weak enough to kill, the one closest to the character will be prioritized. However, if a character can deal enough damage to kill an enemy - but another enemy has already been damaged - the one with the higher amount of health will be prioritized. Keep all of this in mind when you battle as enemies with higher agility may get to you sooner than you can get to them. This is doubly important to pay attention to if your characters have been issued tactics (discussed in the section below). Show No Mercy: The character will fight with little consideration for self-preservation. All spells, abilities, and more will be used until MP has run out. The priority target is any enemy that is closest to death (the highest HP enemy that can be defeated in this turn will have priority). Fight Wisely: The character will use as much MP as their character type deems necessary. If the opportunity for bonus damage or elemental advantage is available, that enemy will be prioritized. If the enemy is resistant to all spells and abilities the character has, it will use a melee attack. The lowest HP enemy that can be killed this turn will be prioritized. Watch My Back: The character assumes a supportive role. Healing and buffs will be prioritized, but the character will also prioritize taking out enemies before allies are hit if possible. Don't Use Magic: As the name suggests, the character will only use melee attacks. Focus On Healing: The character will only use healing spells, and rarely buffs. 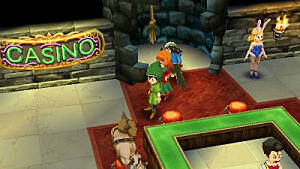 Follow Orders: The character's decisions are made by the player. 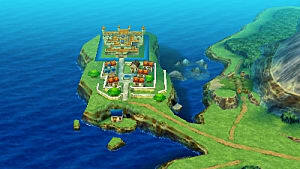 It should be noted that each character follows each tactic based on their personal skills, and their highest potential. 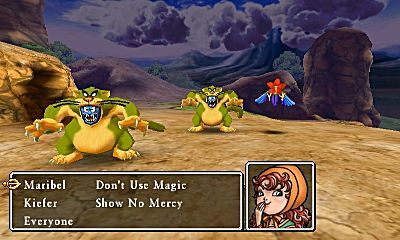 As such, characters who are best at magic (such as Maribel) should be set to "Don't Use Magic" or "Follow Orders" when not fighting bosses. Alternatively, characters who do not use MP and little in terms of buffs or defensive skills (such as Kiefer) should be set to "Show No Mercy" at all times. Try out different combinations, and find out what works best for your party! Pay attention to your enemy's element! 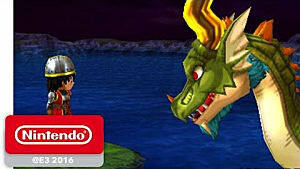 While they may not always be obvious, most monsters in Dragon Quest will be visibly attributed to a certain element. Ice and Fire do extra damage to each other, and so do Lightning and Wind/Vacuum spells. You can usually tell which element your enemy is based on their attacks! Grinding is your friend! If ever you find yourself unable to progress further, set all your characters to "Show No Mercy" and grind for a while. This will make the process faster, and enemies will give you less trouble after you have leveled up. Be sure to check how much experience you still need to level up at the Church as well! Do not give any seeds to Prince Kiefer! 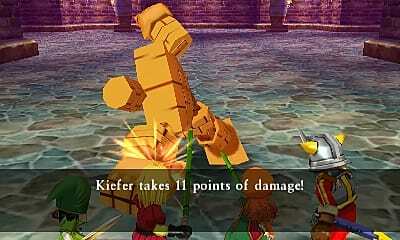 For story reasons, Kiefer will leave your party at a certain point in the game. He will not return to your party until after the main story, so do not waste seeds on him. Try out multiple classes (vocations)! Once you unlock the ability to change classes, experiment with different combinations. While there are always claims about which class is "best", sometimes that class won't fit into the party you want to use. Pick your favorites, mess around with their classes, and see what team pushes you fastest to victory! Remember to read weapon descriptions carefully. Some weapons have special effects. As such, don't just randomly replace weapons just because they have higher damage. Some can attack groups of enemies all at once, while others have a chance of causing status effects. 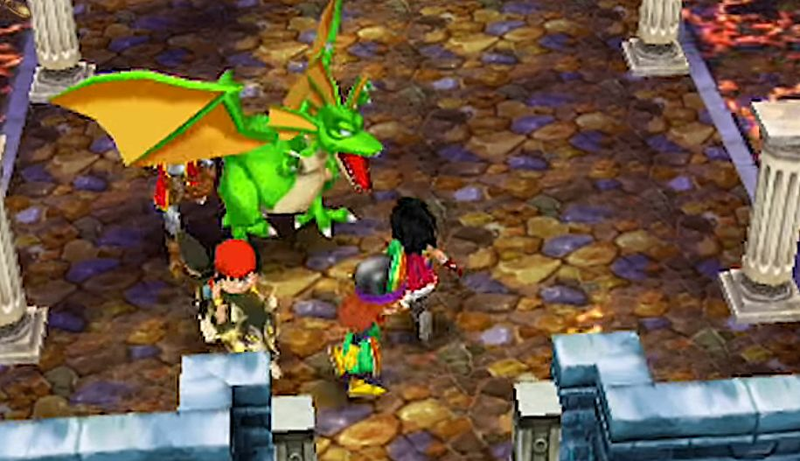 Dragon Quest's style of battle is deceptively easy. 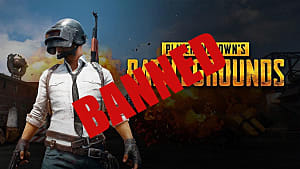 If you follow these tips, you should come out on top every time. That said, don't expect to win every battle as the game's difficulty constantly ramps up from the start onward. Always pay attention to how strong your opponents are compared to you, and be sure to always buy new armor and weapons when you can.